For poet Robert Frost, his farm at Derry in southern New Hampshire was more an inspiration than an economic success. Poet Robert Frost (1874-1963) wanted to be a farmer. At that he had little success, but as a poet he defined an era in American life. He is still among America's most beloved poets. The Robert Frost Farm in Derry, southern New Hampshire (map), where the poet and his family lived from 1900 to 1911, figures frequently in his work. Many images in his poems were born of scenes and experiences at the farm. Now preserved as a National Historic Landmark and as a New Hampshire state park, the Robert Frost Farm offers poetry readings, displays of Frost, his live and times, a walking trail, and other activities. The drive from Boston to the farm takes less than an hour. To find the farm, follow I-93 to Exit 4. Follow NH Route 102 (Broadway) northeast through the town to the intersection with NH Route 28, Main Street, at a traffic circle. Go 1/4 of the way around the circle and turn right onto Route 28 (Main Street/Rockingham Road) south. Drive less than two miles south and you'll see the Robert Frost Farm on the left (east) side of the road. The farm is open from May through mid-October for a small admission fee. Buildings are not open in the winter, but the parking area and walking trail may be used. 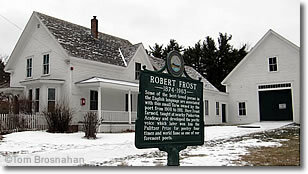 If you're interested in Robert Frost, his life and work, you may want to visit also The Frost Place, his farm in Franconia, New Hampshire, and his burial place in Old Bennington, Vermont.